SAI Animation Peek is a small utility to quickly preview layers as a sequence of animated images. 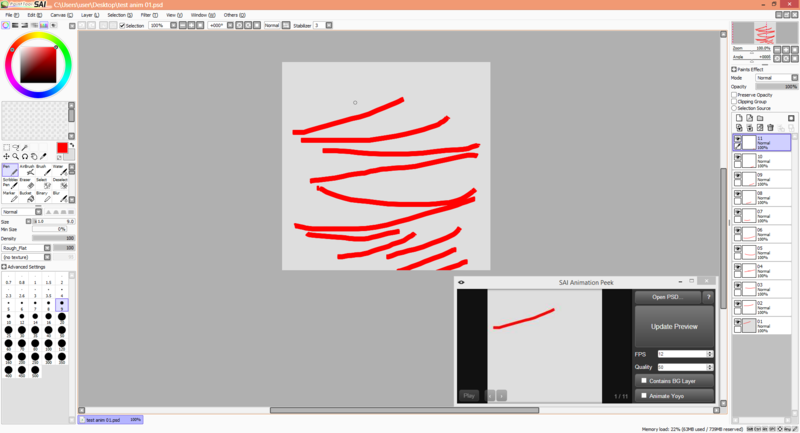 In other words, it greatly helps animators previewing their work while working in Paint Tool SAI. 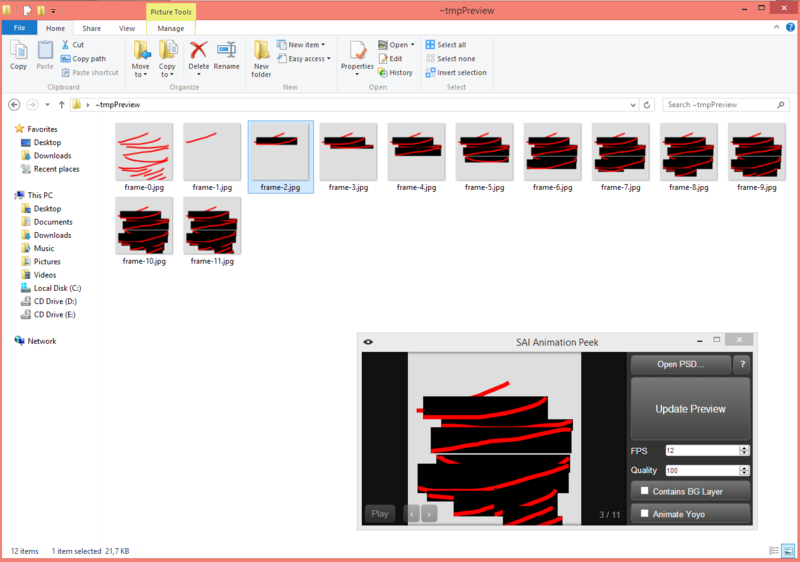 As I work a lot with Paint Tool SAI myself in order to create frame-by-frame animations, it was a lot counter-productive to export every single layer as a PNG manually in order to test if any details were off. This tool will take a PSD file that you will be working on, and every time you save a new animated preview will be generated for you, so you can quickly preview your animation. The problem with SAI is that the .sai file format is not under anyone's radar, plus it is not well documented, so there's no parsers out there to help, but for PSD, no matter how broken the file format is, there are some (non-perfect) solutions. ImageMagick is one of the best choices I had when creating this tool. Check the included Readme.txt for more info on advanced settings too! This app is free! If you are using this app and find it useful, please kindly consider a donation, thanks! Follow me @alexandervrs on Twitter for any future updates! >> Download << Updated to 1.8.0! i've been checking it and I have the followings suggestions. 1) when you work on SAI, usually works with a white background. sai shows you a white one. but this tool, takes the background color as black. is you work with the first layer with another color, this will be the only background colored image. while the other frames, appears as black. in the ~tmpPreview folder, I have the frames as many layers I had used. quite good thing. but in the preview mode, the animation makes a "jump" between frames. as you can see here, the jump from these 3 frames, goes from 1 to the 10 and 11 frames. but in the ~tmpPreview, I had them in the correct order. another thing to add is if you change the quality from 50 to 100, the image shows these. so, as I say, I don't know if this is a visualization issue or just my machine. in any case, please if you update the tool, do not remove the tmppreview as close, or add a message that individual files are saved and if you want to save then apart or something. those files can be pretty usefull as I may say. also, if you can have a export option to save those frames in any other format, that could be very a sweet option. jpg is not a very friendly image for animations if I may say. I know is a preview animation tool, but this could become a very usefull tool aside from previews. Added: Settings are now saved and restored from in the file "SAP.Settings.ini", saves Color, FPS & Quality. If you delete this file, the program will generate a new one with the default values next time. As you see, background color is now customizable, the image file order is fixed too, problem was the sort order was incorrect (was using the OS ordering instead of actual numeric sort). As for keeping the exported image files, I think I might just add an option to properly export them as PNG and GIF, though the scope of the application wasn't really the export part, but we'll see. Slow day today so I added a few more features in and fixed some more bugs. Now it seems that the app works correctly. Added: Extra checks for invalid values in "SAP.Settings.ini"
so nice if it works inside SAI. very light too. It works on top of it to the side, should not get in the way, especially if you got an ultrawide screen like I do! 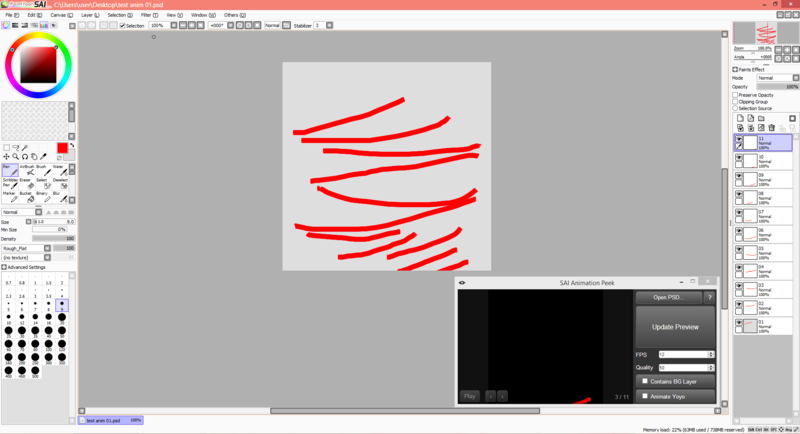 Hello, does this work with Paint Tool Sai 2?